Higos Insurance Services has donated £500 to Springboard Opportunity Group, based in Clevedon. Springboard are a local charity who support children with additional needs and disabilities from birth to five years, from their four centres in Weston-super-Mare and Clevedon. Springboard was established in 1986 by a group of parents unable to find help for their young children with disabilities, and their vision is for every child in North Somerset to have the care, opportunity, education and support they need to reach their full potential. Springboard was brought to the attention of the Higos Community Fund by Victoria Jones, an Insurance Adviser who lives in Clevedon and works in the Higos Bridgwater branch. Victoria’s nephew Noah has 8p23 deletion syndrome, specifically 8p23.1, which means a small part of the short arm of chromosome 8 is missing. 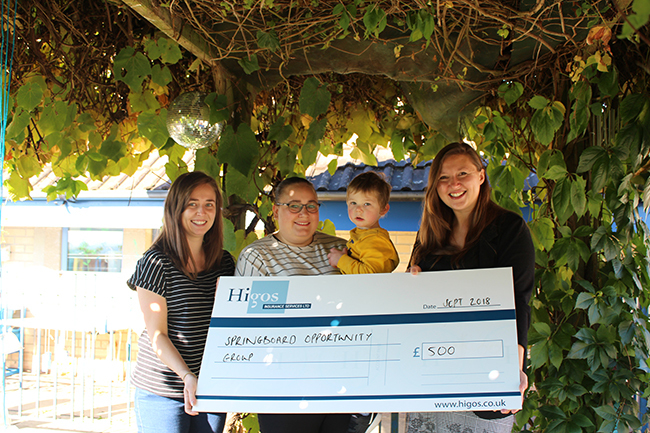 Lauren Overton (left), who is Noah’s keyworker, receives a cheque from Victoria Jones (middle), who is holding her nephew Noah and Felicity Franks (right) from the Higos Community Fund.